WASHINGTON — President Donald Trump said Wednesday he may yet declare a national emergency to get around Congress and build a border wall, if spending talks fail. “I think we might work a deal and if we don’t, I may go that route. I have the absolute right to do national emergency if I want,” Trump told reporters during a bill signing in the Oval Office. Though Trump did not say so explicitly, the legal path involves redirecting Department of Defense funding. Trump said his “threshold” for such a declaration is “if I can’t make a deal with people that are unreasonable,” by which he meant congressional Democrats who are fighting his demand for $5.7 billion to build a wall along the U.S.-Mexico border. Not only would such a declaration lead to a politically fraught reshuffling of funding under the existing fiscal 2019 military construction budget, Democrats have threatened such a move would invite a lawsuit. The president visited Capitol Hill on Wednesday for a lunch with Senate Republicans to consolidate support among moderates ahead of a third round of bipartisan negotiations to end a government shutdown dragging onto a third week. “In my meeting with acting Secretary Shanahan, I cautioned him that if President Trump directs DoD to circumvent Congress in such a legally dubious way on such a major issue, Congress will have to reevaluate its relationship with the Department and judge whether each instance of broad flexibility granted to the Department is worth the risk of abuse by President Trump,” Durbin, D-Ill., said in a statement. Sen. Brian Schatz, the top Democrat on the Senate Appropriations Subcommittee on Military Construction and Veterans Affairs, said the move would ripple negatively through long-term defense plans for the Future Years Defense Program. “If he goes this route, I think he’ll be sued and he’ll lose,” Schatz said of Trump, but declined to speculate who would do the suing. Some Republican lawmakers have expressed skepticism over such a move, including Sen. Shelley Moore Capito, R-W.Va., who chairs the Senate Appropriations Homeland Security subcommittee. She told The Hill she supports building the wall but said the president should “tread lightly” when it comes to using an emergency declaration. Senate Armed Services Committee’s chairman, Sen. Jim Inhofe, was among five GOP senators offering the president a path to fund the wall outside the Defense Department — though they did not present it that way. On Tuesday, they reintroduced Inhofe’s WALL Act, which proposes cracking down on federal benefits for undocumented immigrants and raising fines for overstaying a U.S. visa to then use those funds for the wall. On the idea of redirecting Pentagon funds, Inhofe said, “I don’t want that. However, if he were to declare an emergency, we might be in a position where we don’t have a choice. “I think we could fight it, but I wouldn’t want to do that because [Trump’s] out of options, and I want to get this issue behind us,” Inhofe said, adding that the controversy has become too big for the money in play — $5.7 billion for the wall. “If we’re without other options, we’ll have to go ahead and do it,” Inhofe said. The bill was co-sponsored by Sen. Inhofe, SASC Cybersecurity Subcommittee chair Mike Rounds, Texas Republican Ted Cruz and Louisiana Republicans John Kennedy and Bill Cassidy. 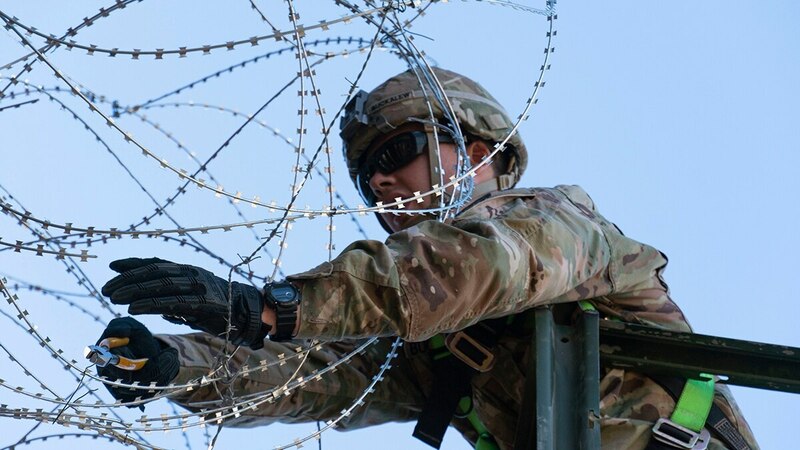 “By funding the wall through increased fines, we prevent any risk of dipping into Department of Defense funding, which is already stretched thin,” Rounds, R-S.D., said in a statement. The ideas in the bill include a requirement for taxpayers to provide a Social Security number to claim various tax credits and require a $300 fee for taxpayers using an Individual Taxpayer Identification Number — which together would yield $33.5 billion over nine years, according to an estimate from the Joint Committee for Taxation. The bill would also bar welfare and housing applicants from receiving welfare benefits if they cannot legally work in the United States.